Gnuplot comes with the possibility of plotting histograms, but this requires that the data in the individual bins was already calculated. Here, we start with an one dimensional set of data that we want to count and plot as an histogram, similar to the hist() function we find in Octave. In Fig. 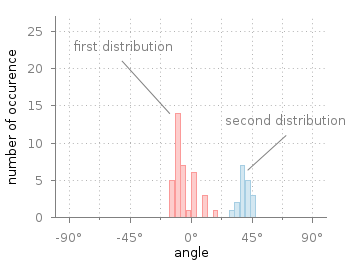 1 you see two different distributions of measured angles. They were both given as one dimensional data and plotted with a defined macro that is doing the histogram calculation. The macro is defined in an additional file hist.fct and loaded before the plotting command. For a detailed discussion on why @hist calculates a histogram you should have a look at this discussion and the documentation about the smooth freq which basically counts points with the same x-value. The other settings in the file define the width of a single bin plotted as a box and its fill style. Thanks for doing all this tutorials man! This website is just awesome !!! You’ve done a great job. Thanks for that. But i wonder how to draw a gaussian on the graph (by using a fit curve) with only an one dimensional set of data ? It is possible, but complicated. You can not use smooth together with fit. Hence, we first need to store our data to a temporary file and fit them afterwards. The every command is used to ignore the last line in the hist.txt file, which is not needed. This will then result in Fig. 3 at the end. Thanks a lot ! It is working very well. I didn’t know that it was possible to store the data. It will be very useful for my future plots. I hope to see more amazing plots on your website, because I learned lots of things here. Your macro of course breaks down when plotting multiple, histograms with different binwidths or when you do exponential/logarithmic binning. Any nice ready-made solution for that? I have some troubles with this histograms. I do not understand where this last line comes from. Any ideas? Thanks for the article! I have another challenge, is it possible to plot multiple histograms with this method as stacked columns? Thanks a lot for this code. One further question. How does one change the style to make the histogram colouring transparent? Thanks for providing this script. It is very helpful. 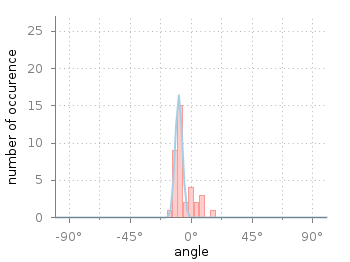 I encountered a little problem when trying to plot a phase distribution in the range of -pi to pi. Easy copy & past will only work under the condition, that the number of bins has to be integer by the chosen binwidth. Otherwise you get artifacts (actual a bin to much at the right hand side). print nobins, ‘ bins with a width of ‘, binwidth, ‘ are used. This is a difference of ‘, binwidth-maxbinwidth, ‘ of target width. Is it possible to get a the histogram as a spline(smooth line) instead of the bars? Many thanks for your tutorial!! However, could you please explain the meaning of these numbers? and I would like to plot two histograms from columns 2 and 3? Great tutorial. I’m wondering if you can help me. I need to make a histogram with a poisson distribution fitted on it. I keep finding how to fit a Gaussian or binomial, but no Poisson. I have a data file consisting of single column having 1000 rows. I would like to plot normalized histogram and then would like to extract the middle point of each bar (x,y values of each) of the histogram. Next would like to fit with a user defined function those data. Would you please provide me the gnuplot script if possible?